Launch yourself into an undersea adventure, where a modern day crew straight out of ‘20,000 leagues under the sea’ wait for you to come onboard. With a slight steam punk edge, we love the graphics and characters, from a one eyed captain to a fiesty black female mechanic, a Dr Livingstone-esque explorer and a couple of curious scientists. It appeals to our inner adventurer, or at the very least our inner bookworm reading Jule Vernes tales of hidden kingdoms. Best of all, it’s Intuitive to play on any device, Subtopia mobile slot works on Android, iPad or iPhone. Subtopia video slot is not for the faint of hearts. We have, in the past, won an impressive 100x our bet in the base game alone, but you’ll have to budget carefully to ensure your game play isn’t swallowed up like the lost city of Atlantis. The main reason for the larger than usual max win slot jackpot of $£€50,000 is a random multiplier meter that jumps anywhere from x1 your win, to x2, x3, and x5. During the free spins games, this is increased to up to x6 your bet, though the free spins are as likely to bring you a big win as the normal reels themselves. This bonus feature is original enough to keep you interested and playing, and the coin range suits all types of slots players, including high rollers. Add a decent return to player rate of 96.1 and Suptopia Touch quickly becomes a must to try out for any mobile slot player who loves a little unpredictability in their slot game play. You won’t be waiting for free spins or special features to hit, just watching that meter go back and forth, much more so than the spins. Wild Gold Totem & Scatter Compass: As with any Wild symbol, this replaces any icon on the board, except the scatter symbol which pays in any direction. Multiplier Slider: An innovative feature in the game, you might not notice the little meter at the top right hand corner at first, but you’ll soon be watching it closer than the spinning reels. Randomly choosing a multiplier of 1x, 2x, 3x and 5x, you’ll never know if you next win will be multiplied or not. A new thrill. Free Spins with Multiplier Meter: Get three or more scatter symbols on any reel and you’ll get the free spin feature. You’ll notice that under key features we’ve put down 'varied' for the number of free spins. This is just another way for us to say that we simply cannot tell you how many free spins you’ll get. When we’ve played, the range has shifted from 8 to 35 free spins. Have others had more? Maybe, but we can only tell you what we’ve experienced. Basically, during the free spins round you have a multiplier meter of 2x, 4x, 6x and a crossbones. This meter will randomly switch between the values, until it randomly reached the crossbones, ending the free spins round. Not knowing at what point the free spins will end increases the fun and unpredictability of the game. 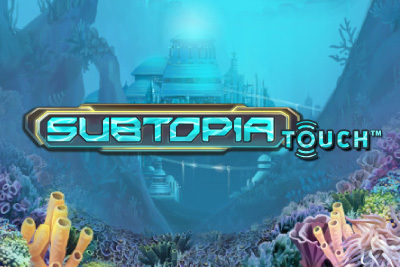 This Subtopia slot is another great game from the NetEnt Touch range. Dive into an undersea steam punk adventure with a rollercoaster ride of a random multiplier feature and some great free spins along the way. Players who enjoy mobile slots that they can predict are better off trying the likes of Thunderstruck or Fruit Shop, this is for the gambler who likes to sit at the edge of their seat, off on an random exploration.